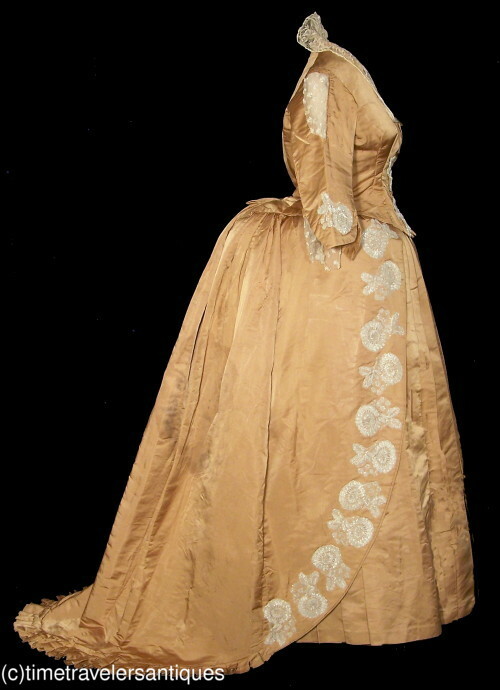 A radiant original circa 1887 lady's two piece golden silk satin reception gown with a cascading train. 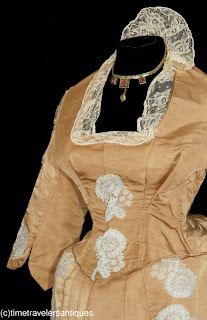 A lined and stayed bodice with a lace modesty insert and collar. Sparkling bugle beaded floral rosettes adorn the bodice and sleeves that repeat on the skirt. Beaded tulle inset gussets to the sleeves, a split tail, and a blind front hook and eye closure. The skirt has an attached pleated crinoline lining to the back, a directionally pleated skirt front with a faux overskirt, a cartridge pleated waterfall train, and a pleated hem. 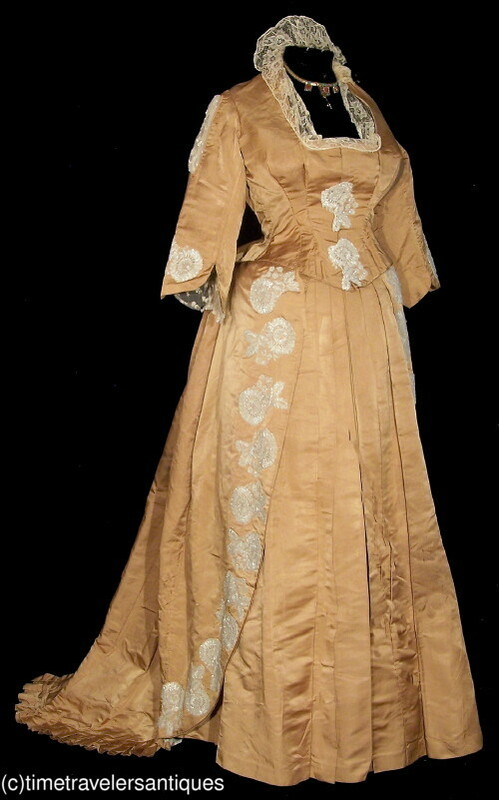 15" from shoulder to shoulder, a 38" bust, 28" waist, and 54" from shoulder to front hem. Shown with a necklace and foundation that are not included. In clean sound as found condition, with gussets added to the back of side seams, and with back seams let out, all incorporated in to the construction of the bodice and done when it was made. 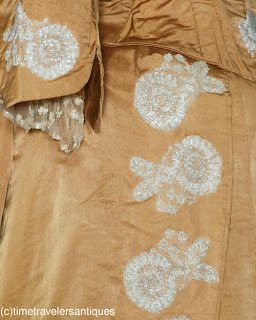 Some spotting at the cuffs that is transfer from the beads as well as in a few other places, and some soiling at the seat of the skirt. A golden Victorian era reception gown. 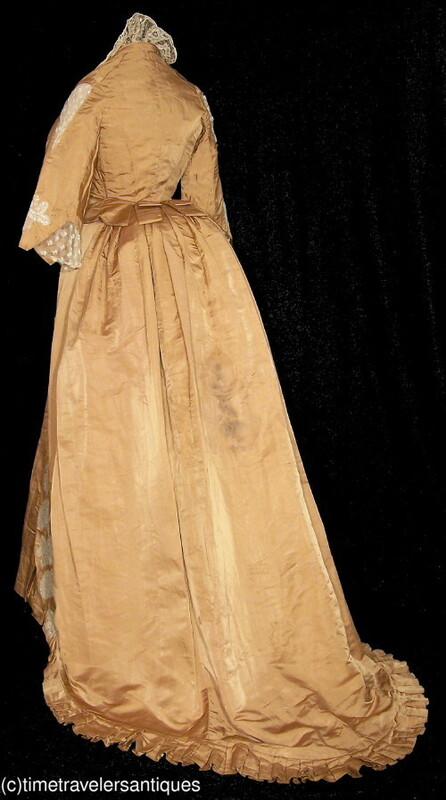 The only thing stopping me from putting this under the late 1860's, is the shape of the skirt. The sleeves look earlier to my eye.